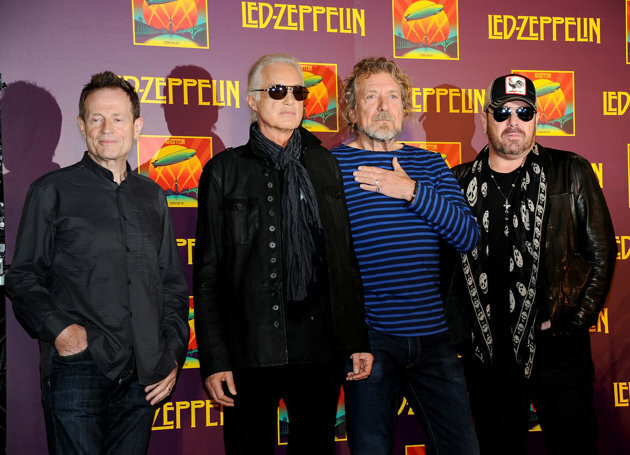 Led Zeppelin had another reunion yesterday, but it wasn't to perform. Instead, Robert Plant, John Paul Jones, Jimmy Page and Jason Bonham held a press conference to discuss the upcoming release of "Celebration Day"; their concert film documenting their Earth-shattering 2007 one-time performance at London's 02 arena to honor Atlantic records founder Ahmet Ertegun. Any question about another reunion was met with sarcasm, stoic silence, and even the occasional barb at reporters that dared to ask. Well, that's just swell... these guys aren't exactly spring chickens anymore, so if a tour doesn't happen soon, it likely never will. 12 year-old me is very, very disappointed. For the rest of us who couldn't afford to travel to London and spend $5000 on a ticket, "Celebration Day" will be released worldwide on Oct. 17 on 1500 screens before its release on DVD Nov. 19.